If water is the life of a hydroponic or aquaponic system, a water pump is a device that brings breath to them. It's almost impossible not to find a water pump in any commercial production, and not even in your small indoor growing spaces. But do you know how to pick the right one for your systems? 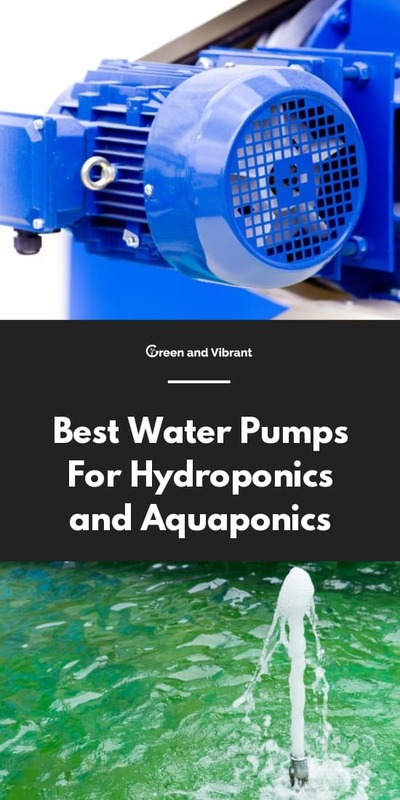 In this article, I'll explore on the best water pumps on the market that can fit hydroponic home growers. And of course, these can be used for aquaponics and aquarium growers as well. When do you need a water pump? For some systems like traditional DWC, Wicking, you do not need a water pump. But for Aquaponics, and some other hydroponic systems like RDWC, Bubbleponics (two variations of the DWC), Ebb & Flow, Aeroponics, etc., a water pump is a must. It plays a critical job for the system by moving water and providing nutes for your plants/fish. You must distinguish between an air pump and a water pump. The role of the water pump is to pump water while the air pump aerates the water. In other words, a water pump moves water and nutrients while an air pump infuses oxygen into the water system. When you cannot get plant roots to come into contact with the water like the classic Deep Water Culture, you have to use a pump to flow water to your plants. Without water, your plants are bound to die in several hours. A submersible water pump is underwater. It is placed inside your water reservoir. This is by far the most common water pump used in hydroponic and aquaponic applications. But its biggest downside is it creates heat within the reservoir in which it stays. Another important point is that submersible water pump is not suitable for a large system, ideally fewer than 1200 GPHs. And submersible pump power is often measured by GPH, how many gallons of water the pump can move in an hour at different head heights. Meanwhile, you often see that an inline water pump and other water-moving machines like water chillers use HP (horsepower) - how much power a machine uses as a power measuring unit. This is because a submersible pump is not strong enough just like the inline or water chillers to measure by HP unit. An inline pump is a pump placed out of the water. You'll encounter inline water pump in most commercial hydroponic or aquaponic farm. This type of pump does not have the fancy of ease of use like the submersible pump and is often more expensive, noisier. And as said above, the inline pump does not create as much heat in the reservoir like the submersible pump. And it tends to have more power and durability. So it's often used in a larger system. 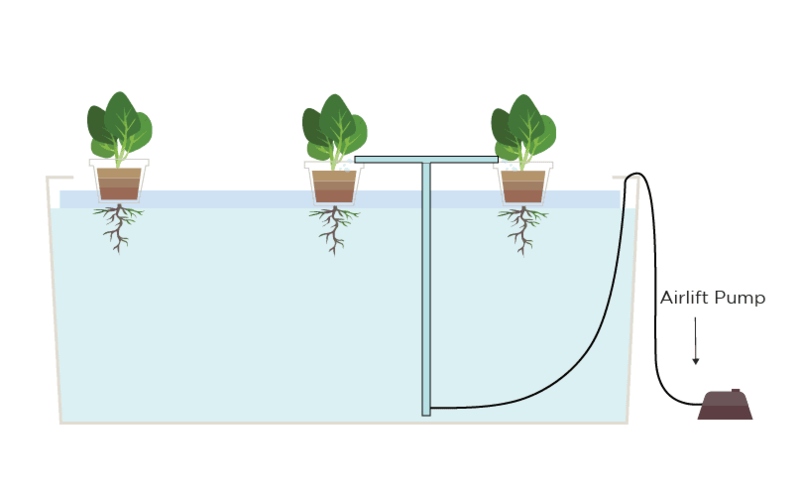 In some systems, you can see growers use an air pump (which is often not submersible) to blow the airflow and move the water to the plant roots. An airlift replaces the water pump and moves the air nutrient solution from the tank to plants roots. But airlift is not as strong as a water pump and not really efficient to use in a medium or large reservoir. To exactly size the system, you have to know how much water the pump can pump into your system in certain hours. There are lots of factors involved. - Types & sizes of hydroponic system you are using (timer-based or siphon-based aquaponic systems), types & sizes of hydroponic systems (aeroponics, DWC,...). - The desired head heights of your systems. Head height is the distance from the bottom of the water tank to top of the water surface you want to reach. You will often see the manufacturers have various GPH (gallon per hours) at different head heights. See the chart shows GPH at different head heights of a water pump. Normally "Max head heights" is the water level that your pump has to pump the maximum pressure. At the highest head height (6.89 feet from the chart), you'll see that the measurement shows 0 GPH, at which level the pump doesn't need to lift any water. - Growing media used (Some materials can hold the moisture well, meaning that you don't need a stronger pump and pump frequently); And the surrounding growing environments and the other factors. There are some ways to size the pump for different kind of systems (Hydroponics, Aquaponics). But it's not easy to follow, and most common users find it hard to do. So I will not explain it in details here. If you want to find out, just do a simple google search. Most manufacturers will give the optimal size fo fit your reservoir. They often will list different GPHs at various head heights. This is the best way to find the right size. But to make yourself in a safe place, you should get a water pump that is larger than your current needs to give yourself more flexibility in case you can grow your system later. If your system is small, it's better that you stick with the submersible pump. It is favored its price and ease of use. You don't have to pay for fittings and have less worry about leaks. 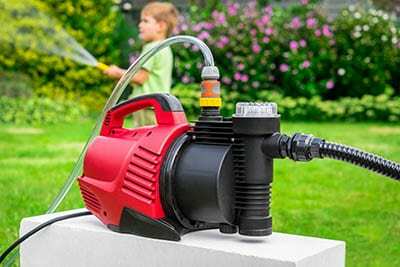 This is also the most popular types of pumps used by hobby or small growers nowadays. If you really need a more powerful pump for a larger system, or if your place is too hot, or if you run a submersible pump in some system where plant roots are always in the water like the deep water culture, you can consider an inline pump. You may think about using a water chiller if the system gets too hot, but the chiller price makes it not a great option for many growers. How efficient is the water pump? Not all water pumps are the same. Some will be more powerful and efficient than the others. So you should look at how many GPH the water pump can move at different head heights. If one pump gives a more GPH at the same head height than the others, this is a more efficient pump. But as you may have guessed, a more efficient water pump tends to be more expensive, but it will be more durable. Hydrofarm Active Aqua is well advertised among hydroponic growers, but it can be used for Aquaponics and Aquarium with great results. One great pros is that this model can be used in salt water (as stated by Hydrofarm that 40 GPH - 160 GPH models (which are made with steel shaft) are not suitable for salt-water uses while 250 GPH - 1000 GPH (made with ceramic shaft) versions (which are made by) can be used for salt water operation.
. But just like other pumps, even the most premium ones, even when the pumps can be used in salt water, their lifespan is not assured to be as long as ones that are used for fresh water. This oil-free pump comes with removable impellers, foam filters rubber mounting feet, and a 6-foot heavy duty power cord. The 1-year warranty is average enough on the market to cover all risks while using the product. So, this is a great pump best suited for either small to medium reservoir. EcoPlus is another popular brand for the water pump with their proven quality. They have a number of water pump options - bottom draw, fixed flow, Mag drive, adjustable. And each option also has a variety of power to choose as well. If you are going to use the Ecoplus 390W fixed flow, this is a powerful oil-free pump that works well either for hydroponics to fountain and pond. This pump has ceramic shaft and bearings which greatly improve its durability even in salt water. It is a non-adjustable flow pump, but personally, I found that you really don't need the adjustable function much. An inlet, 120V cord and multiple fittings are included out of the box. The TetraPond pump aims at a larger system with the largest model able to accommodate up to 1500 gallons. It is packed with a pump cage out of the box that helps prevent medium-large debris from entering the pump. If you need a stronger filter, a pump pre-filter, and in-pond skimmer, which are sold separately, do a great job for your system. 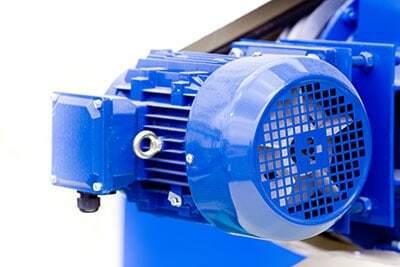 This pump uses the magnetic drive technology that brings efficiency to your water reservoir. And best of all a 3 year-warranty period does give a great sense of safety for clients getting their products. One downside is that users of this water pump stated that this pump filter did not screen out well and that the pumps can get clogged a lot. Overall, this is a great submersible water pump you can get for either a pond, small waterfalls, hydroponics, and aquaponics. VicTsing water pump is very popular among hydroponic growers. This is largely because of its super competitive price. This pump has a stainless-steel made impeller which ensures corrosion resistance. A 1/2 and 3/8 nozzle fittings are included so that you can have flexibility for your flow setup. It compact size together with its strong enough performance makes this a good versatile pump for any small water application. And finally, just like other standard water pumps in the market, Victsing pump has a 1-year warranty and a maximum 24-hour customer service. So if you need a budget pump for a small water system that can last for some time, VicTsing is no doubt a good pick. So you have no worries replacing one if the one you are using happens to break down. Size: 2.56" x 1.65" x 1.95"
The PonicsPumps come with a variety of models and flow rate size ranging from 92 GPH - 291 GPH. The 120GPH with 5' cord is recommended for a 20 gal tank. It is oil and copper-free; so safe to use for plants and fish. Made by aluminum oxide ceramic shaft makes this product more durable and able to operate in salt water. It has an adjustable water flow, but I myself don't find it much useful because the water pump is not strong enough to limit the flow even you set it to the maximum. The product has a 1-year limited warranty, which is fairly average on the market. But for a budget water pump with quiet operation and good performance, this is a great small pump for a small system. If you are searching for a stronger pump for a large water reservoir, you should opt for other products. How often do I need to run the water pump? It's hard to tell. But you should understand your environment, the systems you are using, the plants you are growing. Basically, plants do not need much water during the day, especially when the lights are off. The growing media you use play an important role in retaining or draining the moist for plants. For example, if a growing medium keeps the water well, like Coco Coir, you can increase the water pump interval period via the timer. My water pump is causing lots of noise. How to reduce it? The first thing to say that you must adapt to the environment because every kind of pump makes noise. You can opt for a submersible pump, which is often less noisy than an inline pump with the similar power. Or if the water application is near your working or living area or bedroom, you can consider placing it to a distant place. Some growers try bringing the noise down by using a sponge, scrubber pad and wrap around the pump, this does work, but you should bear in mind that it can affect your pump's lifespan. Others use a sound dampening pad and places under the pump; this also can work to keep the noise down a little bit. What if my water pump is clogged? Many times you will see that your pump stop working or makes lots of noise, the causes can be that debris or some substances will choke you pump. It's time to take the pump out of the application and clean it. 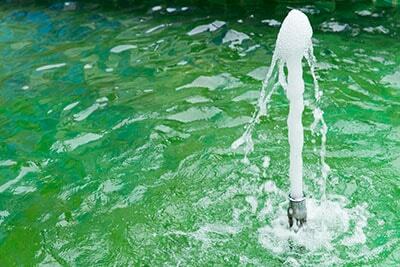 If it doesn't have any problem, you also should maintain your pump regularly - once every month or two months. You can also limit the clog by buying a pre-filter (if your pump allows it). Some users also find putting the pump inside a mesh bag and then place it into the reservoir work. That's it - water pumps for water applications (hydroponics, aquaponics, and others). To sum up, if you need a budget water pump for a small system which you don't mind replaces every once in a while, the VicTsing the great choice. If you are looking for an efficient and more durable pump for a small to mid water applications, go with the Hydrofarm Active Aqua Submersible Water Pump. And lastly, say your hydroponics or aquaponics system is medium to large, and you need a more powerful and durable pump, I would recommend the Tetra Pump. It has a decent quality and best of all a 3-year warranty period puts them at about the middle to high pack in the industry and gives a high secure sense for users.